Scientists find that estimations of high-altitude atmospheric water, critical for the greenhouse effect, are not as accurate as previously thought. Water vapor is one of the most important greenhouse gases. As it drifts through the atmosphere, the vapor absorbs heat. The warm, moist air rises, leaving the planet’s surface and emitting that heat back out into the upper atmosphere. To determine how well we understand the behavior of water vapor at high altitudes, Jiang et al. compared three different reanalyses—long-term records of changing weather patterns over time—to satellite observations. The Microwave Limb Sounder (MLS) is an instrument aboard NASA’s Aura satellite that takes measurements of the atmosphere’s composition, humidity, and temperature at altitudes of roughly 8 kilometers and above. The researchers used such measurements to examine the accuracy of water vapor calculations from two versions of NASA Modern-Era Retrospective Analysis for Research and Applications (MERRA and MERRA2) reanalysis and the European Centre for Medium-Range Weather Forecasts (ECMWF) Interim Reanalyses—all of which provide climate modelers with estimations of how much water is in the atmosphere. The authors specifically investigated the amounts of water in the upper troposphere and lower stratosphere and how much water was transferred between the two layers. This was the first study of NASA MERRA2 reanalysis since its release in October 2015. They found that the reanalyses were fairly inconsistent with the MLS observations. The reanalyses overestimated the average amount of water in the upper troposphere, overshooting the MLS observations by about 150%. The team also found that the MLS measured water vapor traveling between the two layers slower than the reanalyses predicted. Vertical transport within the lower stratosphere in the tropics was 168% faster than the MLS measures according to the ECMWF, whereas MERRA numbers were only 10% faster than the MLS ones. The rate of horizontal water movement was also skewed: MERRA had water moving 106% faster in the Northern Hemisphere and up to 45% slower in the Southern Hemisphere, and ECMWF was 16% faster in both hemispheres. Citation: Sullivan, C. (2016), The forgotten water vapor at high altitudes, Eos, 97, doi:10.1029/2016EO045075. Published on 5 February 2016. Scientists have observed an increase in carbon dioxide’s greenhouse effect at the Earth’s surface for the first time. The researchers, led by scientists from the US Department of Energy’s Lawrence Berkeley National Laboratory (Berkeley Lab), measured atmospheric carbon dioxide’s increasing capacity to absorb thermal radiation emitted from the Earth’s surface over an eleven-year period at two locations in North America. They attributed this upward trend to rising CO2 levels from fossil fuel emissions. The influence of atmospheric CO2 on the balance between incoming energy from the Sun and outgoing heat from the Earth (also called the planet’s energy balance) is well established. But this effect has not been experimentally confirmed outside the laboratory until now. The research is reported Wednesday, Feb. 25, in the advance online publication of the journal Nature. The results agree with theoretical predictions of the greenhouse effect due to human activity. The research also provides further confirmation that the calculations used in today’s climate models are on track when it comes to representing the impact of CO2. 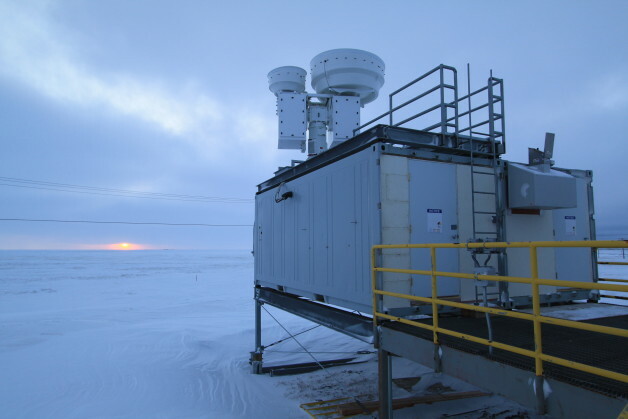 The scientists measured atmospheric carbon dioxide’s contribution to radiative forcing at two sites, one in Oklahoma and one on the North Slope of Alaska, from 2000 to the end of 2010. Radiative forcing is a measure of how much the planet’s energy balance is perturbed by atmospheric changes. Positive radiative forcing occurs when the Earth absorbs more energy from solar radiation than it emits as thermal radiation back to space. It can be measured at the Earth’s surface or high in the atmosphere. In this research, the scientists focused on the surface. They found that CO2 was responsible for a significant uptick in radiative forcing at both locations, about two-tenths of a Watt per square meter per decade. They linked this trend to the 22 parts-per-million increase in atmospheric CO2 between 2000 and 2010. Much of this CO2 is from the burning of fossil fuels, according to a modeling system that tracks CO2 sources around the world. “We see, for the first time in the field, the amplification of the greenhouse effect because there’s more CO2 in the atmosphere to absorb what the Earth emits in response to incoming solar radiation,” says Daniel Feldman, a scientist in Berkeley Lab’s Earth Sciences Division and lead author of the Nature paper. “Numerous studies show rising atmospheric CO2 concentrations, but our study provides the critical link between those concentrations and the addition of energy to the system, or the greenhouse effect,” Feldman adds. He conducted the research with fellow Berkeley Lab scientists Bill Collins and Margaret Torn, as well as Jonathan Gero of the University of Wisconsin-Madison, Timothy Shippert of Pacific Northwest National Laboratory, and Eli Mlawer of Atmospheric and Environmental Research. The scientists used incredibly precise spectroscopic instruments operated by the Atmospheric Radiation Measurement (ARM) Climate Research Facility, a DOE Office of Science User Facility. These instruments, located at ARM research sites in Oklahoma and Alaska, measure thermal infrared energy that travels down through the atmosphere to the surface. They can detect the unique spectral signature of infrared energy from CO2. Other instruments at the two locations detect the unique signatures of phenomena that can also emit infrared energy, such as clouds and water vapor. The combination of these measurements enabled the scientists to isolate the signals attributed solely to CO2. The result is two time-series from two very different locations. Each series spans from 2000 to the end of 2010, and includes 3300 measurements from Alaska and 8300 measurements from Oklahoma obtained on a near-daily basis. Both series showed the same trend: atmospheric CO2 emitted an increasing amount of infrared energy, to the tune of 0.2 Watts per square meter per decade. This increase is about ten percent of the trend from all sources of infrared energy such as clouds and water vapor. Based on an analysis of data from the National Oceanic and Atmospheric Administration’s CarbonTracker system, the scientists linked this upswing in CO2-attributed radiative forcing to fossil fuel emissions and fires. The measurements also enabled the scientists to detect, for the first time, the influence of photosynthesis on the balance of energy at the surface. They found that CO2-attributed radiative forcing dipped in the spring as flourishing photosynthetic activity pulled more of the greenhouse gas from the air. The scientists used the National Energy Research Scientific Computing Center (NERSC), a DOE Office of Science User Facility located at Berkeley Lab, to conduct some of the research. The sun is responsible for virtually all energy that reaches the Earth’s surface. Direct overhead sunlight at the top of the atmosphere provides 1366 W/m2; however, geometric effects and reflective surfaces limit the light which is absorbed at the typical location to an annual average of ~235 W/m2. If this were the total heat received at the surface, then, neglecting changes in albedo, the Earth’s surface would be expected to have an average temperature of -18 °C (Lashof 1989). Of the surface heat captured by the atmosphere, more than 75% can be attributed to the action of greenhouse gases that absorb thermal radiation emitted by the Earth’s surface. The atmosphere in turn transfers the energy it receives both into space (38%) and back to the Earth’s surface (62%), where the amount transferred in each direction depends on the thermal and density structure of the atmosphere. This process by which energy is recycled in the atmosphere to warm the Earth’s surface is known as the greenhouse effect and is an essential piece of Earth’s climate. Under stable conditions, the total amount of energy entering the system from solar radiation will exactly balance the amount being radiated into space, thus allowing the Earth to maintain a constant average temperature over time. Scientists accept that a massive injection of carbon into the atmosphere caused the PETM, but they don’t agree about where the gas came from. Some researchers say it originated from the release of carbon locked up under the ocean by an undersea landslide; others blame a comet crashing into Earth, causing carbon from both the comet and Earth to be oxidized to carbon dioxide and potentially causing wildfires or burning of carbon-rich peat bogs on Earth. They also don’t know how long the release lasted, with recent estimates ranging from 10 years to 20,000 years. One of the best ways to measure the prehistoric release of carbon into the atmosphere is to look at the ratio of two types of carbon atoms called isotopes. Carbon has two stable isotopes: About 99% of natural carbon is carbon-12, whereas the remaining 1% is mainly the heavier carbon-13, with trace amounts of radioactive carbon-14 that decay within a few thousand years to nitrogen. Living organisms have a slight preference for the lighter isotope, so carbon derived from organic sources (such as fossil fuels) is slightly depleted in carbon-13. If that carbon gets returned to the atmosphere at a faster rate than normal, atmospheric carbon dioxide has less carbon-13 than normal. Plants taking up this carbon dioxide become even more carbon-13 depleted, and when they decompose, this depletion is recorded in the soil. Sedimentary rock samples that have been compacted from soils formed at the time of the PETM contain less carbon-13 than normal. Sedimentary rocks of the Bighorn Basin in Wyoming contain one of the best records of soils from this period. Geologists have studied them for more than 100 years, but to obtain samples from soils of different periods, geologists had to analyze surface rocks from different parts of the basin and try to piece together a continuous geological history. Therefore, the Bighorn Basin Coring Project, run by the University of New Hampshire, Durham, drilled approximately 1 km of core from each of three different points in the basin to give geologists three clear, continuous records of how the soils had varied over time in a particular place. Bowen and colleagues analyzed one of these cores, tracking the variations in carbon isotope ratios in greater detail than had been previously possible by examining surface rocks. They report online today in Nature Geoscience that in soils beneath those laid down during the main rise in temperature about 55.5 million years ago, there was a distinct drop in the proportion of carbon-13. In soils immediately on top of these, the ratio seemed to recover to its normal value. Finally, soils on top of these showed a large drop in the proportion of carbon-13 corresponding to the PETM itself. The researchers used climate models to investigate how the initial, smaller heating could have triggered the later surge in temperature. They estimate that the first thermal pulse is likely to have warmed Earth’s atmosphere by 2°C to 3°C, but that the atmospheric temperature would have gradually returned to normal as the heat was absorbed into the deep ocean. However, when that heat finally reached the ocean floor, it might have melted methane ices called clathrates, releasing the methane into the ocean and allowing it to make its way into the atmosphere. As a greenhouse gas, methane is 21 times more potent than carbon dioxide, so a sudden spike in methane emissions could lead to huge climate change. “We think this is really good news for our contention that the release of carbon was very fast,” says marine geologist James Wright of Rutgers University, New Brunswick, an advocate of the comet impact hypothesis. Wright is not convinced, however, about the importance of the first pulse in triggering the second. He suggests that the most logical interpretation of the apparent cooling after the first pulse is that its significance was less than Bowen’s group believes, with limited effect on the overall ocean temperature, and that not just the atmosphere but rather the entire planet quickly returned to normal. “If that’s the case, then the first has nothing to do with the second,” Wright says. That, in turn, would require an alternative explanation for the PETM such as a comet impact.